Our new collaboration with Balfour International had finally putting up 5 3D screens located at Sunway Pyramid Mall! Finally ..yea finally…After all the work and headache..
A new and emerging way of advertising, cool and really cool..heheh..
Go and visit them at Sunway Pyramid Mall! because I am the Leo Woman..
Why are you so hard to just accept what people suggest, instead of asking so many question and doubt everything? Why are you never stop demanding and wanting more? My answer : Because i am Leo woman. You are ambitious and commanding. You will like to be in positions where people look towards you for guidance and direction. A Leo woman has sufficient mental and emotional strength to don the mantle of a leader. You tend to perform better in a stressful situation more than in daily routine. A Leo woman is mentally very agile and has a very good grasp of the things. However she also has the tendency to while most of her time in pursuing activities of leisure and recreation. Indeed i am. A bit commanding but that’s because i hate when simple work cannot be done with lame excuse! I am very annoying when i keep wanting more. But that’s because, i always believe people can do more when they really do it. Its wrong sometimes, but i really hate it when people just sit on their comfort zone, when they can actually take the challenge and do better in life. And because i was born as Leo, and still governed by Leo, its hard for me to accept failure without trying harder. You fail, you get back on track and do it again until you succeed! The Leo woman can show love, forgiveness and kindness to complete strangers or mere acquaintances and yet, may be critical and almost harsh to her loved ones if she feels they have failed her in some way. Few days back, taking my lunch at the office pantry, i can’t help but overheard a group of my office mate chit chating.. They were having some argument on souvenir my boses brought back from a company trip for them. Ha ha it was really funny, but i was just listening. My boss actually just bought a bunch of snacks and chocolate from the trip and put in in the pantry for everyone. While the other boss gives all the staffs under his department beautiful souvenir. Ha ha..well what do they expect? a beautiful souvenir from the boss to them maybe..ha ha..
A : Kedekut la, ade ke beli snack jea..isk..
B : You tau tak, Lin(bukan nama sebenar ha ha) dapat sanggul rambut dari boss die..haaa..Bon (bukan nama sebenar :D) pun pula dapat bekas air cantik. A : Iye?? Eeee tadi bos bagi chocolate tu i buat muke jea..Biar die tau..
C: Dulu pun pegi oversea beli makanan juga. beli la benda2 cantik..Selendang ke kain ke..
B : Pastu nak belanja pun susah. Kedekut la. B : (Looking at me and said) You dapat ape? Me : Err..Nothing…Why should the boss bought me something? Ha ha..I was like, haihh…some people do have the mentality of ‘Boss MUST give something when go oversea’ or ‘Boss MUST belanja makan’..Not that i am judging them, but, that was really funny ..their mentality..We called it pok-silap (when people always want some people to belanja makan or buy something)..
yups..i’ve gove for a vacation with bunch of cute and happening friends..WHERE? 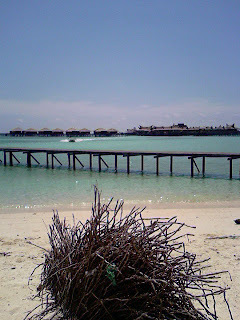 hehe..of course the gorgeous awesome beautiful fantastic SIPADAN ISLAND!! Just back yesterday night so i haven’t get all the photos ready and stuffs, so can’t post it just yet heee..We landed at LCCT yesterday at around 2pm then taking bus to KL Sentral, then from KL sentral taking LRT to my brother’s house (where i park my car). After get the car, we went down to Uptown Damansara for Fish Head Curry, which is sooooo very sedap . Finally heading home around 7.30pm…Reaching home around 8, straight taking my lovely shower..After almost 12 hours journey, it really feel sooo fresh to get shower! And it’s movie time! Heee..my fav TV series Ghost Whisperer and Desperate Housewives! But before that, need to do some house cleaning as the house had been left unattended for 4 days, and dust are everywhere..After cleaning the living room and kitchen, i was ready for my movie! Ah..finally ….i can rest after the long journey.. Some people just won’t grow up.. I have a very interesting discussion with our company’s business partner today, about everything. well, ha ha, he was sharing his idea and experience on business, life and his thought when we were arguing on jobless young men in Malaysia after economic crisis. I appreciate every word he said..
Current economic hardships have had what is called in constitutional law a “disparate impact”: The crisis has not afflicted everyone equally. Although women are a majority of the workforce, perhaps as many as 80 percent of jobs lost were held by men. This injury to men is particularly unfortunate because it may exacerbate, and be exacerbated by, a culture of immaturity among the many young men who are reluctant to grow up. Sad but true, many young (some are not young, in their 30s) men, prefer to stay at home and hoping to get a call from big company offering them a job. Well they might once worked as an executive before, but due to economic hardship, they have to say good bye to their highly pay job..
My answer : I am everything here and there. I don’t have very powerful skills, but i trust my brain and my physical capabilities. (i didn’t tell him that i worked in paddy field before ha ha). So i might be interested on having my own business. Plan A,B and C. i love doing IT business, but i can just sell maybe ‘Sabah chicken Wings’ at Pasar Malam, and do nasi lemak to sell in the morning. OMG i just love that! hehe.. If it didn’t work after 6 months, i will pack and balik kampung. I can always do something there, if there’s nothing in KL for me, God might have spare some opportunity for me in Sabah maybe..Who knows rite..
Yup, for me, opportunities won’t come that easy. One should chase for it. And i can knock all doors just to get at least one good opportunity for me to use. i remember me my sister and my cousins were having a small business selling vegetable around the kampung and at my grandma stall. Ha ha..that was 5 years back after i finish my degree, when we were jobless, really jobless..It was really fun, and honestly i appreciate the moments we need to go to the pasar borong at 4.30am, bargain the veggies, pack them 1 by one into small package, and sell it around the kampung! My beloved grandma, the person who create the strong person inside me, who never accept any ‘NO’ without trying. A strong lady, never cry to show weakness and she just everything for me and the whole families..She successfully create another her inside all her grandchildren. And some people just talking, about having a degree but end up’jual sayur di kampung‘ only, but for me there’s nothing wrong about it! What’s it is to compare to jobless and depends to other people to bagi makan. oh i am so not into that category..i will do anything to get small money even to work in the farm or selling vege at a stall or keliling kampung. because from there, you will start to appreciate the money you gain and it will makes you so much mature.. I recruit all my young cousins to set up small vege farm, and we were having so much fun taking care for it..
maybe some people just don’t want to grow up. And i wonder why…Maybe ashamed to do oh-so-don’t-have-class job, or maybe they just love to depend on others…or maybe their families protect them too much? Hmm no one knows..